Valentine’s Day is just over a week away. This year the holiday falls on a Saturday, so if kids celebrate at school it will likely be on Friday, February 13 (*gulp*). As room parent in NHL’s kindergarten class, I was asked to have a few things in the room for a snack that afternoon. The kids were also told that they could buy Valentines to hand out to each of their friends. 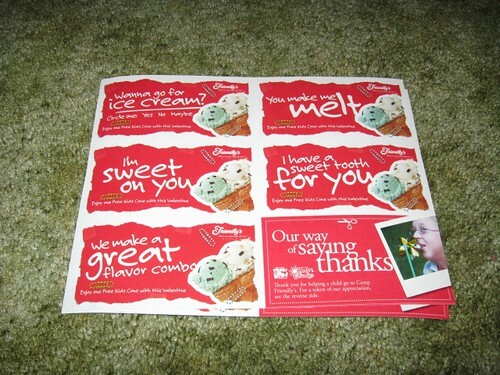 Each sheet contains five Valentine cards that are also coupons for kids 12 and under to receive a free kids cone at Friendly’s. In addition to this, there is a $5/25 for your next visit. NHL agreed that it would be fun to give his friends an ice cream cone coupon. Yes, these probably cost a little more money than the boxes of character cards. The big plus is these cards are a donation and the kids will get something beside an item to toss away. The only catch, if you call it that, is that the cards must be redeemed between February 14 and March 15. We thought it would be nice to bring a smile to the kids in NHL’s class that may not have had a cone in a while. Wish there was a Friendly’s near us.